Good day PISO FARE friends and Happy Easter to the Christian world! Time to rejoice!!! Great easter offer for those looking for cheap airline fares. We got a new Cebu Pacific seat sale 2017 to domestic and select international destinations! Furthermore, Dubai and Sydney promo fares are up to March 31, 2018! 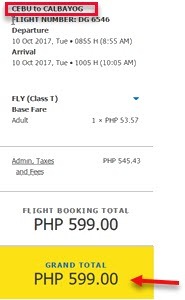 The new Cebu Pacific promo fare tickets are great for September, October, November, December 2017 trips. Thus, you can use the low fares for your Christmas vacations! 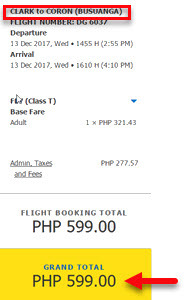 Cheap flights from Cagayan to either Bacolod or Tagbilaran; Clark promo fares to Coron or Caticlan and sale tickets Cebu to Calbayog, Cotabato, Ormoc or Roxas will cost only P599. Just take your pick and fly to these routes for only P599 ALL IN Ticket. Sale flights are good for one-way trip. International promo fares at P899 are very good to be true. Yet, this is authentic. Fly to Taipei from Manila or Cebu for as low as P899. 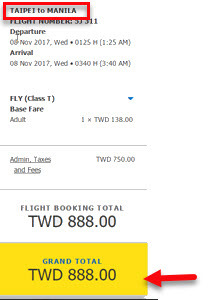 Taipei to Manila promo ticket is as low as TWD 888 or around P1,450. Are you planning to visit Hongkong? 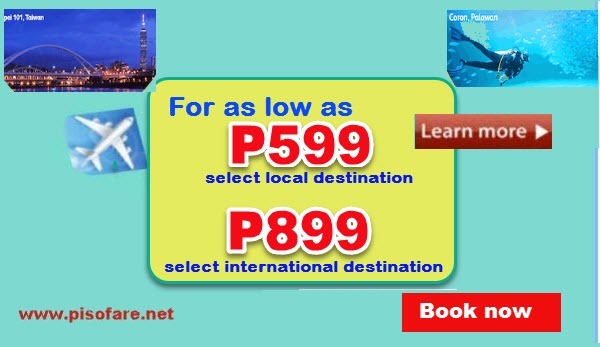 As low as P1,599 promo tickets can be booked for Hongkong from Manila, Cebu, Clark or Iloilo. Want other Cebu Pacific low fares? Well, check the complete list of promo destinations below. As our commitment to our readers, we check if the seat sale is authentic. We went online and search for promo fares. Shared below are some of the sale tickets we found online. Quoted Cebu Pacific sale tickets are good for one way travel. Inclusions: free 7 kilos hand carry baggage, base fare, Web Admin Fee, taxes and fees. 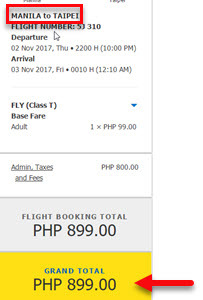 Domestic airport fees for flights originating from Manila, Cebu and Caticlan and international airport fee for flights from Manila re included in the promo fare. Book or get the Cebu Pacific low fares by booking online at www.cebupacificair.com or buying the tickets at Cebu Pacific ticketing offices, accredited travel agents or booking offices. You may also call the airline hotline at phone #: (02) 702 0888 (Manila) or (032) 230 8888 (Cebu) to reserve the cheap tickets. For your convenience in buying the Cebu Pacific tickets, here are Cebu Pacific Ticketing Offices in Metro Manila, Luzon Ticketing Offices, Visayas List of Ticket Offices and Mindanao Cebu Pacific Ticket Offices. Check the List of Holidays and Long Weekends of 2017 to aid you in planning your trips. What are you waiting? Cebu Pacific promo fares are LIMITED. Book your tickets fast to get the lowest fare! For more Cebu Pacific and other airlines promo fares and seat sale 2017- 2018, PISO FARE promos, travel tips and updates, do not forget to LIKE and FOLLOW our Facebook: PISO FARE TICKETS!! !